Growing infrastructural development activities, rising urbanization and rapid industrialization are some of the key growth drivers for submersible pumps market in India. Declining ground water level coupled with increasing agricultural practices have contributed to the demand for submersible pumps in the country. Growing industrial applications such as, mining, power utilities, and oil & gas are likely to complement the India submersible pumps market forecast revenues over the coming years. According to 6Wresearch, India submersible pumps market size is projected to grow at a CAGR of 9.2% during 2017-23. Openwell pumps segment registered majority of the revenue share in 2016, owing to major adoption in agriculture application. In the overall submersible pumps market, agriculture application acquired majority of India submersible pumps market share followed by residential & commercial and industrial applications. The agriculture sector in India is projected to witness substantial growth over the coming years, attributed to increasing facilities and investments in agricultural infrastructure such as irrigation facilities, cold storage, and warehousing. The submersible pumps market is relatively fragmented, owing to presence of large number of foreign and domestic players across the country. Moreover, domestic manufacturers are rigorously focusing towards expansion through mergers and tie-ups with several international players. Some of the major players in submersible pumps market in India include Shakti Pumps, Oswal Pumps, KSB Pumps, C.R.I. Pumps, Kirloskar Brothers, Crompton Greaves, WPIL, Falcon Pumps, Texmo Industries, and V-Guard Industries. The India submersible pumps market report thoroughly covers submersible pump market by type, applications, industry, and regions. 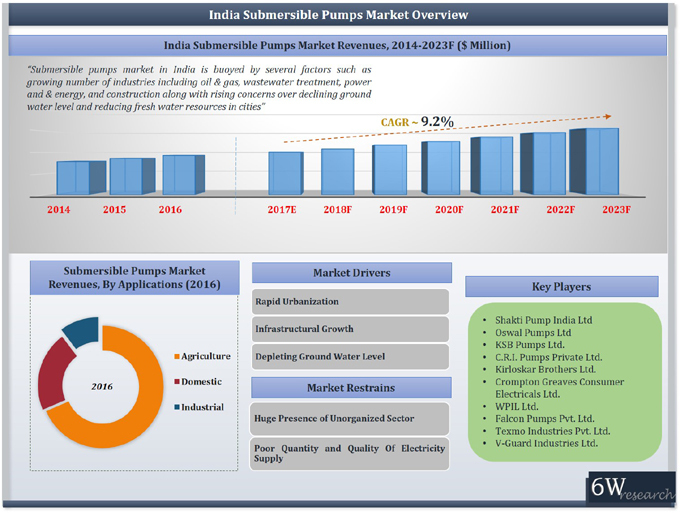 The India submersible pumps market outlook report provides an unbiased and detailed analysis of the on-going India submersible pumps market trends, opportunities/ high growth areas, market drivers, which would help the stakeholders to decide and align their market strategies according to the current and future market dynamics. 11.4	C.R.I. Pumps Private Ltd.
11.8	Falcon Pumps Pvt. Ltd.
11.9	Texmo Industries Pvt. Ltd.